First of all, I want to thank my friend Brett for allowing this very personal story to be shared with all of you. The topic remains a sensitive one in his life, but after much thought he has decided that his experience may be useful to others, and I appreciate his courage in allowing this story to be told. The topic today is swearing, or more accurately, what makes a swear word? He and the resource teacher had an angry disagreement about the format of some written school-work (the circled "50" refers to his anger level on his "angrymometer", a useful concept from Tony Attwood's work). 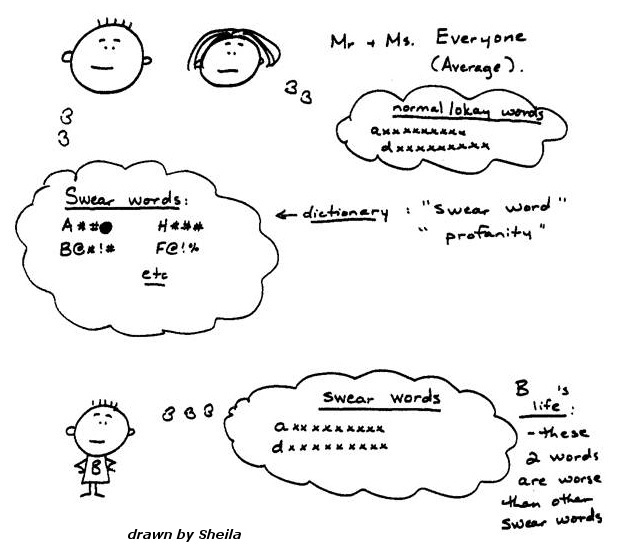 The "a-word" that he's written in her speech bubble is a swear word. Following the incident, Brett was still angry, but also shocked that he had heard his teacher using a swear word in class, and he said something to another student in resource about it. Eventually the discussion ended up in the school office, and they called home. We were all pretty surprised that a teacher would swear in the classroom, and curious about exactly what words she had said. Brett was too upset to tell us the word (he said it was too bad to even write down) - he agreed to listen to me go through the list of most common swear words so he could let me know when he heard the one his teacher had used (even this was very hard for him, because he had a great anxiety about hearing the bad word again). I went through the list, and none of the words were "the one". At that point Brett became a bit impatient with me and said "no, not those, I don't mind those words ... it's the A-word and the D-word that are the really bad ones". The "A-word" is "acceptable" (and related words like "unacceptable") and the "D-word" is "disruptive" (and related words like "disrupting"). It was hard for Brett to believe that others didn't have the same reaction to these words that he did. What makes a swear word? Swear words from other languages don't sound bad to us, in fact they often sound funny. The words themselves are just a collection of sounds, with their literal meaning often relating to body parts, bodily functions and religion. So why do they elicit such an instant negative gut response in native speakers of that language? ... because they foretell negative events. Reliably. Brett had learned that once teachers started to use the A-word and the D-word, it was a safe bet that the situation was going to H-E-double hockey sticks. Additional comments from Brett (today): Swearing is all about "context" - someone using bad words to express their own frustration, but not directing them at someone else is not swearing; but when the words are directed at another person, and are said in a tone that is condescending and degrading, that's swearing. When the teachers used the A-word and the D-word with me, they were lecturing me and it felt like they were talking down to me, telling me that I was wrong and that everything was my fault - it felt like fingers pointed toward me, poking and prodding me sharply like a spear. That's why those words were swear words. They were great. They listened, they respected what he had to say, and they bent over backwards not to use those words in Brett's presence (and that was not easy - any teacher can tell you that those words come up frequently in daily classroom situations). They instituted a "card system" (like on a soccer field) where Brett could hold up a yellow card from his desk if a teacher accidentally used one of the words in his presence - this would alert the teacher, and they would later come by his desk and give him an "apology card". I was so impressed with the school's reaction on this issue. Everyone from the principal on down was informed and part of the program. I drew the first picture, setting up the situation using information from school personnel and Brett. There was a disciplinary situation in class that involved other students (not Brett), but Brett was close by when the teacher used the "A-word" as he tried to sort out the problem situation. 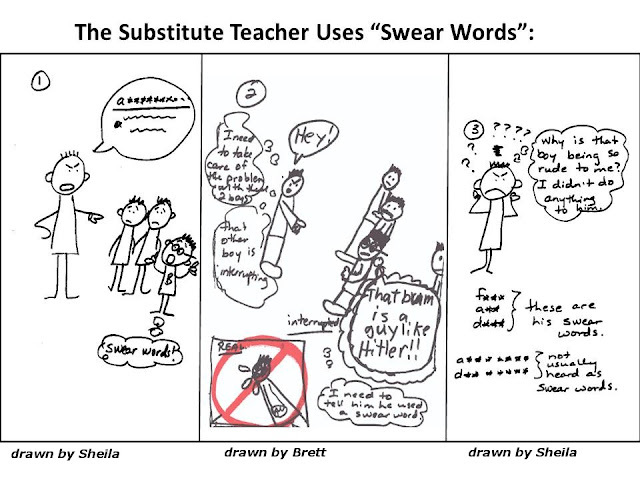 The second picture is drawn by Brett and shows his internal and external reaction to the teacher "swearing" in his presence. He is extremely upset that he had to hear the bad word, and his first reaction is to interrupt the teacher and let him know that he swore and he needs to apologize. 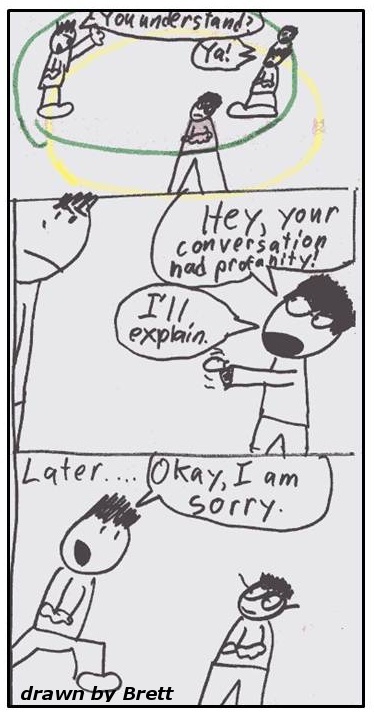 The substitute had no idea what Brett was talking about and so he was impatient with him and wouldn't let him speak (leading Brett to decide the teacher was "like Hitler") - I filled in the thought bubbles of the teacher, to help Brett understand his perspective and where the impatience was coming from. The tongue out "raspberry" was Brett's next reaction to the teacher, and that action resulted in a trip to the school office (with Brett still very upset because the teacher had not apologized for swearing). The third picture in the series was drawn by me to illustrate to Brett that the substitute teacher had no idea that he had used a "swear word". The principal immediately figured out what had gone wrong (that the substitute didn't know about the swear words program) and was quite understanding of Brett's reaction. The plan involved Brett waiting for the teacher to finish handling the situation with the other students, then explaining that the A-word or D-word was profane to him and that he was upset to hear the teacher say the word, and hopefully the result would be an apology from the teacher. The card program was in place for several years and two schools. Brett's high school administration was terrific about letting us talk to staff at the beginning of each school year to help them understand his perspective on this and other issues. But it was Brett's ability to so clearly express his emotional reactions in his drawing that was key in helping teachers to truly understand his point of view. Brett, you're an amazing guy and a great advocate, not only for yourself, but for many other people with Asperger's and Autism. It's my privilege to know you and share in your life. Never lose that wonderful dark sarcastic humour. Thanks for your comments Pam. Brett is now 20 years old, and his years of working through problems with drawing have helped him to understand people better, and to have good insight into his own emotions, reactions and choices. I am so impressed with his maturity and his willingness to keep working through the challenging situations. Definitely my privilege to know him. LOVE the prAACtical nature of this strategy and how amazingly effective it is. Thanks for sharing this story-very powerful!